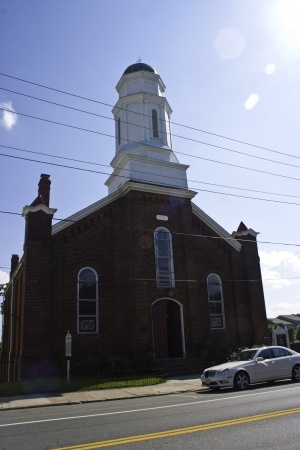 The First Baptist Church on West Main Street was formed on March 16, 1863 when approximately 800 African American members of the Charlottesville Baptist Church (now the First Baptist congregation on Park Street) petitioned to form their own church. On July 8, 1864, the church became a separate entity, but continued to hold services at the parent church until on or about August 20, 1864 when the congregation purchased the old Delevan Hotel at 632 West Main Street. When the Delevan building was condemned and razed in 1876, the congregation held services in the Presbyterian and Episcopal churches while they erected a new building on the Delevan site. On November 7, 1877, the cornerstone of the new church was laid by the Jefferson Lodge, a Charlottesville association of African American Freemasons. The new church was dedicated on January 2, 1884 and renamed the First Colored Baptist Church of Charlottesville on February 17, 1884. The church, a National Register of Historic Places site, is now known as First Baptist Church. The Pastor of First Baptist Church is Hodari Hamilton. The church motto is "Grow in grace and give God glory." 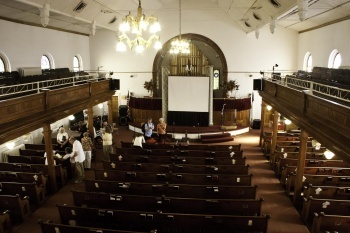 On May 29, 2012, First Baptist opened its doors to the community as part of the city's 250th celebration. The program included a brief presentation on notable First Baptist attendees and their relationship to the community (John West, Benjamin Tonsler, and Rebecca McGinness), hymns sung by both young and old current church members, and a reading from Rebecca Shelton's diary from 1863. Pat Edwards reads from Shelton's diary. Church members sang "I Am on the Battlefield for my Lord." Members of the Sunday School program sang a hymn. First Baptist Church, ca. 1906. McKinney, Richard I., Keeping The Faith, The First Baptist Church, 1981, pp. 38-53. Walker, Corey D. B., A Noble Fight, University of Illinois Press, 2008, pp. 211-15. This page was last edited on 9 December 2018, at 12:25.